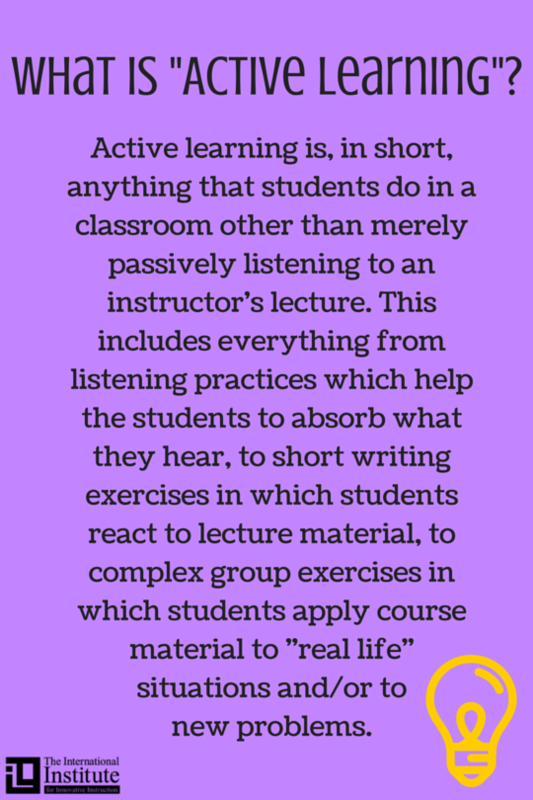 Use Class Activities to Create a Climate for Active Learning! Creating a climate for active learning is critical to a successful start in your classroom. Activities can be conducted on the first day of class (or first session in an online class) that will engage students and promote active learning. The activities can be used to model the desired behavior and encourage students to recognize their responsibility in a successful learning environment. For example, an activity in which every student speaks sends the message that they will be expected to participate in class discussions. Here are a few examples of easy-to-use first day activities that have the potential to produce huge benefits. On one section of the blackboard (or online whiteboard), write: “The best class I’ve ever had” and underneath it “What the teacher did” and below that “What the students did.” On another section, write “The worst class I’ve ever had” and the same two items beneath. Then, ask your students to share their experiences while you fill in the grid based on what they say. Ask them not to name the teacher or course. In short order, their information will paint two very different pictures…it presents a great visual. Stand in front of the “best class” section on the board and tell students that this is the class you want to teach, but that a teacher can’t do it alone. Rather, students and teacher together can ensure that this class lands in the “best class” category. Then, proceed to describe how both students and teacher can make that happen. After you review the syllabus, use this activity to provide students with the opportunity to review the information and meet a classmate. Divide students into pairs. Each students takes one minute to formulate one question about the information in the syllabus. Student #1 asks the question of Student #2. After that question is discussed, Student #2 asks a question of Student #1. Ask each pair of students to share their questions and answers. Ask a student who previously (and successfully) completed your course to record a YouTube video to share their tips on how to be successful in your course. 7 Ways to Increase Student Engagement: This YouTube video has more ideas on using techniques to promote student participation and active learning. Use these techniques to promote active learning and reap the rewards of engaged students. If you’d like to learn more, I’ll be giving a presentation on this topic at Franklin University’s Innovations in Teaching & Learning Conference on June 9th and 10th. You can learn more and register here.